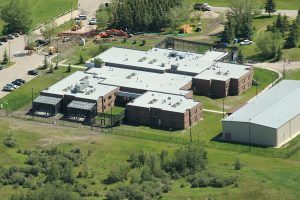 CALGARY REMAND CENTRE – Allmar Inc. Built in 1993, the Calgary Remand Centre provides housing for 704 remanded male and female inmates. Programs include self-management, independent living skills, addictions awareness, and substance abuse. The complex includes an outdoor exercise yard, weight room and activity room in each living unit, and a gymnasium and library. Allmar supplied the architectural hardware, along with the hollow metal doors and frames.